This Class was created by Craig Van Batenburg and is as Unique as Craig is. If you have ever has trouble understanding the 3 parts of electrical energy (Volts, Amps, Resistance) this is your class. In the most simplistic way Craig will explain how to diagnose any electrical problem. A few hours will make a huge difference in your “on the job” ability to fix electrical problems. “Electrical Analysis for the Confused” Make sure you know the basics in regards to Volts. Amps and Resistance. This very easy to understand Electrical Training (known as the Army Man class to many). OHM’s Law … a new model. Ohms law is a mathematical formula that helps us understand the relationship between Volts, Ohms and Amps. Many have learned this but forget it quickly. Seems as if there was no real application when it comes to fixing cars. Knowing Ohms law helps a lot! ACDC has a new model that will stick and will help you fix cars better. Enter the “ARMY MEN”. This is a true story.. the names were not changed so we had someone to blame. I opened up the hood and there in front of me lay my car battery with its battery cables, sitting cold and quiet, the metal from the cable connectors gleaming dully. Nothing much is happening here. But wait! Something very strange was happening to me! I was shrinking, and everything around me seemed to be getting bigger! When I had shrunk to a thousandth of my natural height, the pits and ridges in the surface of the metal appeared. I kept on shrinking, 1000 times more, and started to enter a very strange world. The surface of the metal looked like giant caverns, and fault lines between the metal crystals appeared. Needless to say I was feeling very strange by now, but I was so fascinated by what I was seeing that I hardly had time to be terrified! After I had shrunk in height another 1000-fold, something very strange came into focus: ARMY MEN! These soldiers were not at rest! They were relaxed but at attention! When I looked near the positive terminal of the battery I found them all facing away from the battery, standing together, not quite touching the army men in front, behind, to the left or to the right, gently marching in place. I was by now so small that I could step in among the army men and follow them as they tramped along. I noticed various side roads along the way, each of them full of army men just standing there marching in place. We left them behind. Then we come to a place where the mighty horde divides, with most of the army men heading toward the motor and the rest heading toward the headlights. We stayed with the ones heading toward the lights. When we reached the filaments it was like a journey through hell. The way got narrow but our whole army had to get through the filaments quickly. Our army men roared out their battle cry and attacked the wires fiercely. Sweating and straining, they pulled their way through the tangled web of tungsten atoms at lightning speed, urged on by the maddened horde behind them. Their arms and legs were a blur of motion. 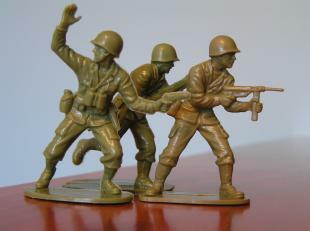 To my surprise I saw that the army men were actually pulling the atoms so hard and fast that they were heating them up, white hot. Finally, drenched with sweat and exhausted, these poor soldiers emerged from their ordeal. Drained of all their energy, and listless, they nevertheless keep on marching, pushed on by others emerging from the filament behind them and pulled on by some invisible force. Ever onward they marched, until they reached the battery. Surely, I thought, they would get to stop now for a little R & R! But no, these poor guys kept right on marching, right on through the battery! But an amazing thing was happening inside the battery! A whole pit crew descended on them to rinse them off, rub them down, feed them and ply them with energy drink. By the time they re-emerged from the battery they had been revived and re energized and were ready to go around again! Suddenly I started growing again. The army men began getting smaller and smaller, and I could see more and more of them! Thousands of Army Men. Millions of army men! Billions of them! There were army men in everything, some of them free to march and some trapped in little clusters which I supposed to be “atoms”. They were everywhere … and then I was too big and they too small for me to see them. The great caves in the sides of the wire shrank until they were just little pits in the shiny metal, and then they too got too little for me to see, and I found myself crawling out from under the hood. No one noticed I was gone and when I was back in my shop, I tried to explain what I had just seen, but none of the techs would listen. “Army men? In the wire? You’ve gotta be kiddin’. Think you’ve finally lost it.” And the service writer, tipped off at what was happening in the shop, greeted me with “Hey Craig, seen any little red men lately? (Laughs)” But I knew what I had seen, and the vision haunted me. After I arrived home that night, my long-suffering wife, Deb, listened to me carefully for five minutes, waiting for the punchline. Her face took on a pained smile as she tried to figure out if I wasn’t joking. Finally she interrupted me with a request to take out the trash. I couldn’t think of anything else to do about this experience, so I called my buddy, Chris Horton, on the phone and tried to explain what I had seen. He laughed and told me that I should get a life! That night as I lay in bed sleep eluded me. My mind was filled with little marching men in uniform, sometimes marking time, sometimes surging forward shouting their battle cry, sometimes struggling frantically through thin wires heated to a brilliant white by their exertions. Bit by bit I drifted into another dimension. I don’t know if I was asleep or awake, or if I was in some altered state not yet known to science, but there I was again among the marching men, struggling through the wires, relentlessly, remorselessly marching on. And I was marching with them! Terror filled my bones! What had become of me? But there was no escape, no release, no rest. I had become one of them! At length I resigned myself to my fate, but I kept watching and taking notes in my mind as we marched along. One thing I noticed, to my amazement, was that when our wire passed near another wire full of resting soldiers, if we passed at a steady speed they would remain at rest, but if we suddenly stopped they would startle and move suddenly but briefly. They would go back at ease, but when we started suddenly they would startle and jump briefly into motion again. Somehow, from a distance, we were “inducing” them to move when we stopped or started. When we stopped or started a look of worry would pass across their faces, a little anxiety rush. We crossed a bridge mined with dynamite. I asked a fellow soldier why, and he said the bridge was there to stop the armies in the case of a riot. If we all ran across the bridge too fast it would overheat and set off the dynamite, which would stop us in our tracks! Next we came to a door, with two paths after it was opened, which appeared to be directing our flow in turn to one or another wire beyond. It would let the army men through into one of those wires, opening the gate and increasing the flow steadily until a broad army was marching together through the gate. Then, suddenly, the gate would snap shut and the whole column would come to a screeching clanking halt. When we had gotten through this door I discovered another very strange thing. It seemed logical that the gate slamming shut in front of us would stop us all. But once we were through the gate we should be able to just keep going whether the gate behind us was open or closed. Right? Wrong! When the gate slammed shut behind us, we came to a sudden clattering halt ourselves! Apparently, when no army men could get through the door behind us, we couldn’t move forward because no army men could take our places! Soon our wire was winding upward like a spiral staircase. I could see the soldiers at the next coils up and down from me very clearly as the loops were very close. And then I saw that there was another spiral inside ours, winding around the same central pole, with not nearly as many loops. Like ours it was full of little men, all of them marching in place but tense, watching us nervously. When our mighty horde stopped suddenly their little army let out a yell of terror and raced forward briefly through their wire, racing through several turns of their spiral in little more than an instant, before crowding up against each other and stopping again. After this had happened a few times I became intensely curious about what could be going on over there in the other coil. Where were those terrorized army men going? Would we ever get there? Would we loop around and loop back and go surging and halting through the inner coil in our turn? It was hard work going through our coil! Somehow those other guys in the inner loops seemed to be robbing us of our energy! Soon we had cleared our outer loop and had plunged nearly exhausted into the inky darkness of the car body itself. Slowly we shuffled along through the car body, a vast enormous army of ignorant shuffling grunts bumping and jostling each other endlessly. At last, after what seemed like forever, I and the bunch I was traveling with emerged out of the car body and listlessly shuffled into the battery. As we were traveling through the battery, getting the royal treatment again, taking refreshment and getting our sore muscles rubbed down, getting our energy restored, I kept wondering about that inner coil. Where did it come from? Where did it go? How did those marching men in the inner coil rob us of our energy, and what did they do with it? When at last, re energized and refreshed, we emerged from the battery, I made up my mind to get back to those coils. I could see that my regiment was headed for the wire to the headlight, so with a huge effort I broke free of them and struggled over toward the wire leading to the coil. The marching men I struggled past glared at me in disapproval and cursed at me, and some of them tried to grab me, but I slipped through their grasp. They themselves never seemed to go anywhere but where the marching men next to them and in front and back of them were going, and they obviously regarded what I was doing as highly improper, perhaps even illegal. But my need to know drove me on. Another question that I was puzzling about was this: what kept us all in the wire? Beneath our feet in the wire there were clusters of what looked like marching men, but all wound up in balls. As we passed they would struggle to get away from us but they never seemed to break loose from their clusters. Outside of us were other clumps of little men, wound up in balls, sometimes held in place around our wire and sometimes floating by like great lumpy balloons. When I tried to grab a hold of one I found I couldn’t. I was free to move from clump to clump in the wire, but when I tried to leave the wire by grabbing a hold of a balloon, the soldiers on the balloon shoved me away and the soldiers in the clumps in the wire grabbed at my ankles. I was beginning to see that I was trapped. I was confined to the wire – and the car body. There seemed to be nothing at the moment which I could do, so onward I trudged, puzzling on these things. When we reached the coils I broke rank again. Through sheer force of will, and to the horror of my comrades, I grabbed a hold of a floating balled-up clump of soldiers, and when it passed near the inner coil, to the amazement of the soldiers there, I leapt free from the clump into the inner coil and landed in their midst. A great cheer went up for me and I was immediately accepted as one of them. Now, sharing their fate, resting and surging with them, I began to understand. When the soldiers in the outer coil I had just escaped from were marching, we all watched in tense alertness. But when they suddenly stopped, such a wave of terror filled us that we bolted forward and raced around several loops. We were getting our energy somehow through space, like magic, coming from the outer loop! And what a jolt of it we were getting, like a great shot of adrenaline!! After a while we emerged from the coil, sometimes resting and sometimes advancing in great sudden charges. Soon we approached the end of the wire, but I could see that the marching men ahead of us were making great mass leaps into space across to a fat landing pad full of exhausted marching men. When I got close I could see that their excitement and fear were so great that they were causing soldiers on the floating balloons around them to break loose and join the attack. Each time a surge reached the gap its members would leap into space and grab a hold or the balloons and leap from balloon to balloon in their terror. In doing this they caused great excitement among the balloon soldiers, who let out loud yells. The clumps were almost instantly heated white hot by the energy of these exchanges and this commotion. And then with a great roar it seemed as though the whole universe had detonated. Soon it was my turn, and pushed forward by the horde behind me I made my leap into space and thrashed and struggled through the reluctant sea of blazing balloons to the other side! Safely across, but exhausted, I shuffled along with my new comrades, following the path before me for a long time. When, I thought with despair, would we ever reach the battery? I was so tired and exhausted. But we never did! After a while I found myself coming into that coil again! Oh no! My heart clenched with dread? There would be more terror! Another great leap into fiery space! I was so tired I could barely face it. But to my surprise my fellow marching men seemed eager to ascend the coil. Into the coil we went a surge at a time. A true soldier’s experience it was, long periods of boredom and brief moments of sheer terror. But I began to see something: Here and only here was where this army of soldiers was getting its energy! They hungered for it. But if we were going to go around endlessly from coil to gap, through the wire and back again, never reaching the battery, how would we ever reach home and my bed and the comfortable sound of my snoring wife? Clearly I had to get back to the big coil, and somehow I did. But was I really closer to home? It seemed as though I had been marching around for hours, no, for days. It seemed as though I had been marching forever. How would I escape? As I was pondering this question, the desperation growing in me, I heard a familiar distant sound above the noise of tramping feet and the throbbing of the engine: the faint but unmistakable sound of an ignition key turning. Suddenly, like a line of freight cars on a stopping train crashing into each other, the whole column came to a halt. There we stood, shoulder to shoulder, belly to back, marking time quietly. The whole vast army of marching men had gone quiet and listless. The throbbing of the engine and clatter of the valves stopped almost as suddenly. The silence was overwhelming. As best I could calculate I was somewhere near the entrance to the battery. Perhaps if I could only get there I might find a way to escape. Surely the battery wouldn’t be dead and quiet! Surely up ahead there was a place full of life and energy and action! But no, there was no sound, and no one stirred. I started frantically pulling and scrambling my way forward toward the battery, climbing and pulling my way over the now no longer marching men who were too lethargic to resist much, although I did get a lot of jostling as they tried to block my way and I received my share of curses and threats. Finally with the last of my reserves I managed to crawl and claw my way through the battery leads, across the tarpit barrier of the oxide layer to the battery post, and down to the entrance of the first cell, hope arguing against reason. Then hope failed me. No one was moving. The soldiers on the edge of the battery were at least awake and alert. They would love to get through it. They certainly felt its pull. The loving hands of the battery workers were there to receive them. But the marching men in the battery and on the other side weren’t moving, couldn’t get out of the way. The circuit was broken. And if they wouldn’t move, we couldn’t move! No one could move because no one could get out of the way! Never had I felt more trapped, more helpless. Or more alone. Surrounded by these little men marching patiently in place, yet there was no one there who could begin to understand the anguish and panic I felt. Overcome with despair, I let out a great cry, a bellow of pain like the death cry of a wounded beast – and woke with a start to find my wife shaking me and saying urgently “Craig, what is it? What’s wrong?” I was drenched in sweat and shaking. Yes, Craig, that’s my name. This is my bed, my wife, my home. I’m alive! I’m human! Never – not even on my wedding night – had I been so glad to see her. I wanted to tell her everything. But how could I explain? How? What could I say? I think I told her I love her. I know I hugged her, and tears came to my eyes, but I didn’t let her see them because I wouldn’t know what to say. I kissed her cheek, and waited till her breathing was regular again. Then I peeled her arms off of me, half crawled half staggered out of bed, pulled on my bathrobe, went to my office, and lowered myself unsteadily into the chair by my desk. I called Chris Horton again. This time I wasn’t kidding so he said he would be right over. In my mind the battle cry of the electrons echoed again, and little marching men were all around me. I put on the small desk light, pulled my bathrobe tight around my sweat-damp body against the chill of the night, and waited for Chris. I took a few notes so I wouldn’t forget this dream. When Chris showed up I talked non-stop for a long time. Then Chris and I both lit up a cigar, I relaxed and he explained to me what all this meant. You see, Chris has his PhD. in Nuclear Physics and because he is my friend he believed me. He understands me and electrons very well. I will let Chris explain. The army men, well they are the electrons of course, the ones that can flow through a conductor. The clumps of army men that kept pushing back and made Craig stay in the wire, those were the insulators, little balls of rubber and such. The men that left for the headlights were the current flow, or what you may know as amperage. In fact if we counted all the army men as they passed through the wires it would be like hooking up your low amp probe. The army men getting weak after going through the headlight filaments, that is the voltage dropping or the army men’s strength being used up as they do their work. And the resistance, that is anything that gets in their way. Another way of looking at is this. Amps are the numbers of Army Men at work, voltage is their strength and resistance is the path or road and also the device they work in. It is that simple. It takes getting as small as the tiniest army man to see them at work. Once you can see electricity then it becomes easy to understand. This dream was experienced by Craig Van Batenburg. The man I called to help me with this dream was Chris Horton. Craig and Chris are real people. They both live in central Massachusetts. Together we wrote this story and now Craig Van Batenburg teaches an electrical class based on Army Men.